The 12 Survivors Bare Bones Field Dressing Kit makes processing your game meat fast and easy. This unique bare-bones knife kit includes two unique blades, a guthook and caper. The Gut Hook Knife boasts a razor-sharp 3.2” drop point blade, complete with an integrated guthook notched into the spine near the blade-tip. 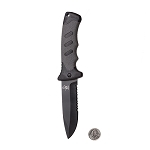 The Caper Knife features a 2.6” blade. Both are skeletonized single piece knives constructed of heavy-duty 5Cr15MOV stainless steel with jimping strategically machined on the spines and at various gripping points around the ergonomically designed handles. 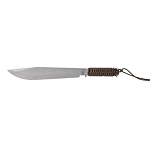 Bare Bones Field Dressing Knives include Defense Grip Coating for safer, slip-resistant cutting when things get messy. 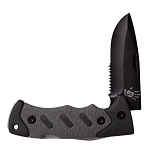 The 12 Survivors Bare Bones Field Dressing Kit includes a rugged piggy-back sheath with built-in knife sharpener.